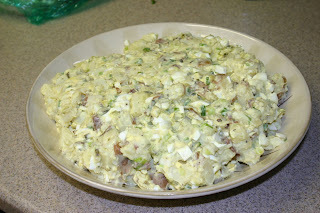 In a large bowl, combine potatoes, eggs, green onions and pickles. Set aside. In a small bowl, combine mayonnaise, vinegar, mustard, dill, salt and pepper. Pour dressing over salad; mix gently. Referigerate at least 1 hour to blend flavors.